The public is invited to the first event in Occidental College’s series “The 75th Anniversary of the Japanese American Incarceration: Never Again,” a short film and lecture by Emiko and Chizu Omori. 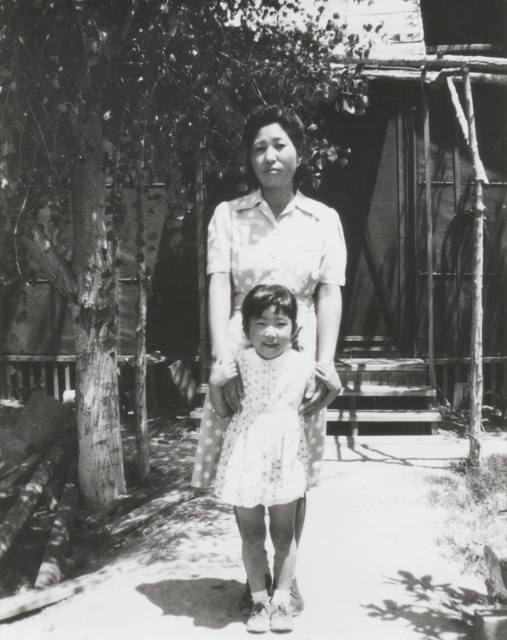 Emiko Omori with her mother, who died only a year after the family was released from camp. The program will be on Sunday, Feb. 12, from 1 p.m. at the Choi Auditorium, 1600 Campus Rd. in Eagle Rock. Born in 1940, Emiko Omori was a year and a half old when her family was forced into the Poston concentration camp in Arizona. She later graduated from the cinema department at San Francisco State University and became an editor and cinematographer at KQED in 1968. Since then, Omori has freelanced as a cinematographer, producer and director as well as making her own award-winning films. “Rabbit in the Moon,” a documentary about her family and the incarceration of Japanese Americans during World War II, premiered at the Sundance Film Festival and won, among its many honors, a national Emmy. She and her sister will speak following the screening. Chizu Omori is a freelance journalist living in Oakland and the co-producer of “Rabbit in the Moon.” Between ages 12 and 15, she and her family lived at Poston. She was active in the redress movement for those incarcerated in the camps and was a named plaintiff in the class-action lawsuit filed by the National Council for Japanese American Redress (NCJAR), which was argued in the Supreme Court. She will discuss the commemoration of the 75th anniversary of the signing of Executive Order 9066 by President Franklin Roosevelt and its relevance to current events.